The magic that can be created with artificial ice extends beyond its traditional and expected uses to create authentic sets for the film industry: Synthetic ice for television commercials, and movie sets, are easy to be incorporated into production creations. Modern technology has broken down the barriers of the traditional uses of ice rinks; so much so that synthetic ice can transform into a collection of scenery on a TV or movie set. Think of it as stage furniture: an ice rink in the background of a park, decorated with snow capped trees and extras enjoying the natural feel of artificial ice. Movie productions that feature a winter pond or a rink in an outdoor setting often travel to colder climates solely to film a scene. Synthetic ice can be used on set in any location, any time of the year with a winter wonderland theme, making it easier for the cast and crew to film and saving the producers a significant amount of dollars. Synthetic ice can also be installed and disassembled in a fraction of the time needed for a traditional ice rink. great alternative to traditional rinks, as a themed setting can create an atmosphere that captures the essence of a water-based rink. Not only is the look and feel of synthetic ice completely natural, it’s quick set up, inexpensive cost, and ability to accommodate any size or shape, makes Artificial Ice Events a favorite with producers. One of our many conveniences is the availability to rent winter themed props and accessories typically associated with an ice rink or frozen pond: a ticket booth, snow machines, and even figure skaters. These additional options are available for any season ice events and nearly every climate. Broadway play sets can be brilliantly transformed with the use of synthetic ice. Play writers often steer away from unconventional stage props, such as the use of a heavy skating rink. Customarily, it would be extremely difficult and costly to set up a skating rink on stage, not to mention the dangerous weight put on the stage. An artificial ice rink brings the production to life without the hassle, with actual ice-skating for the wintry scenes. The benefits expand beyond the visual production; the ambiance of a skating rink brings feelings of euphoria and of youth, setting the scene to capture the heart of your audience. 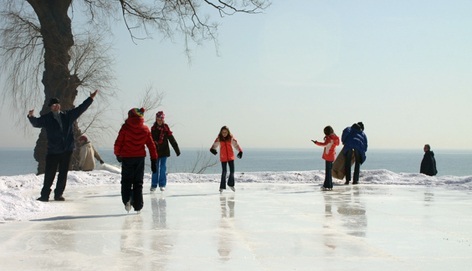 Synthetic ice does not necessarily have to be used for skating. As an alternative, it can be used as a scenic background on the set, beneficial to producers looking to create the magic of a winter landscape. A combination of decorative props will enhance the seasonal magic. Artificial Ice is a great alternative for a picture perfect movie setting, commercial, or TV set. Versatile in any climate, fast and easy to set up, synthetic ice is the best choice for an authentic set. Contact us for a Free Synthetic Ice Estimate today!